How many of us sit at a desk all day? Do you carry stress in your neck and shoulders? How many of us are staring down at our cell phones and tablets for multiple hours every day? We put A LOT of strain on our neck muscles so it’s important that we put some effort into loosening them whenever we get the chance. Our Oakville Acuncture Team is here to help! There are 4 big culprits for neck stiffness, pain and even headaches! Your suboccipital muscles, splenius capitus, levator scapulae and trapezius can all cause a tight neck! 1 – The trapezius is a big muscle that attaches at the base of the skull, the tips of the shoulder and all the way down to junction of your mid and lower back. Theses are the muscles that feel great when someone rubs your shoulders and can carry a lot of tension – especially when you’re stressed out! 2 – Levator scapulae attaches to your upper neck and the tip of your shoulder-blade. These muscles can contribute to a lot of stiffness in the neck and upper back. 3 – The suboccipital muscles are located right at the base of your skull. There are 4 small muscles on each side of the skull that can cause all kinds of aches, pains and headaches when they get tight! 4 – Splenius capitus. Pain felt behind the eye and in the temple area can be a result of this muscle being too tense. The solution to this tightness? ACUPUNCTURE. It is so good at relieving the tension caused by poor work posture, cell phone/computer use and stress. Acupuncture needles are the answer to your tight muscle’s prayers. 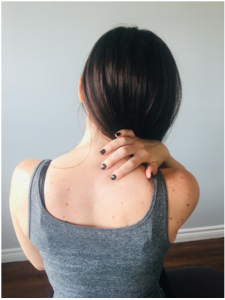 There are points along the spine, into the trapezius, into the suboccipitals and levator scapulae that can help relieve tension in all of these muscles. The needles only have to stay in for about 12 minutes and are painless when they’re inserted. Have you ever woken up, realized you slept funny and can’t move your neck? A locked up joint in the neck can be incredibly painful and completely limit your range of motion. Typically this causes very sharp pain with any head movement, and you may feel like you need to keep your hand on your neck for support. Even sitting up in bed can be excruciating when these joints get stuck. Guess what – there are great acupuncture points for that too! There are some points that are located directly along the spine, and can actually touch the joints that get locked up in the neck. Using these acupuncture points helps to increase blood flow to the joint and helps to decrease the muscle spasm around the affected joint. If you’re wondering if you’d benefit from acupuncture, come in and talk to Dr. Jenn about it. It is an excellent option for treatment of neck pain – whether the root cause of the pain is the muscles or the joints!